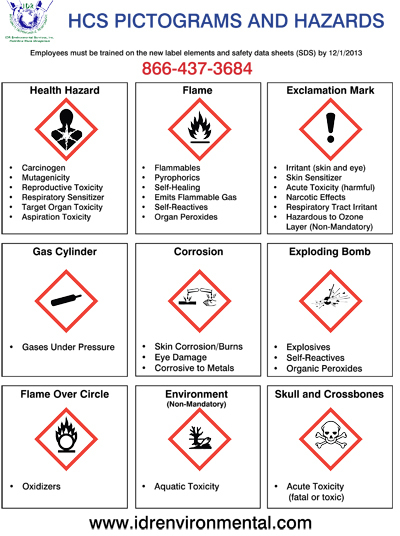 The new hazard communication standard, also known as OSHA's hazard commincation standard and hazard communication standard pictograms, still requires chemical manufacturers and importers to evaluate the chemicals they produce or import and provide hazard information to employers and workers by putting labels on containers and preparing safety data sheets. However, the old standard allowed chemical manufacturers and importers to convey hazard information on labels and material safety data sheets in whatever format they chose. The modified standard provides a single set of harmonized criteria for classifying chemicals according to their health and physical hazards and specifies hazard communication elements for labeling and safety data sheets. For a more detailed brief on the new standards for labels and pictograms, download the OSHA Brief on Labels and Pictograms. For a detailed Hazard Communication Standard Pictogram sign you can use in your place of business, just click the link below to download a FREE version. The sign is print ready and is 8.5” x 11” in size.